Yesterday The National Review posted an article about the lawsuit suing Remington for the shooting deaths at Sandy Hook Elementary School in Connecticut. Rule No. 1 of tort law: The bad guy is the one with the most money to pay you. Unfortunately that (and politics) seem to be what is driving this lawsuit. On December 14, 2012, Adam Lanza murdered 26 people, 20 of them schoolchildren ages six and seven. Lanza killed himself, too. Can’t sue him. Lanza had a history of mental illness — a long one. He’d been treated under the New Hampshire “Birth to Three” program and later by the Yale Child Study Center. But it would be hard to make a case against those institutions, which enjoy a great deal more sympathy than gun manufacturers do. The schools couldn’t handle Lanza, either, and he was left to the care of his mother, Nancy, who seems to have been a bit of an oddball herself and an enabler. But he murdered her, too, so she’s not around to sue. …The lawsuit against Remington alleges that the company’s marketing practices contributed to the Sandy Hook massacre. “Remington may never have known Adam Lanza, but they had been courting him for years,” a lawyer for the plaintiffs said. But it is not clear that Remington courted Lanza at all — and it is quite clear that the company never courted him successfully, inasmuch as he stole the Bushmaster rifle he used in the crimes from his mother, whom he murdered. Connecticut has a law against “unfair trade practices,” which is a very odd way of looking at a mass murder. This is another way of saying that Remington’s owners are being sued for failing to concur with the substantive political views of gun-control advocates, i.e. that the weapon in question is “ill-suited for legitimate civilian purposes such as self-defense or recreation,” a claim that, it is worth noting, is false on its face inasmuch as semiautomatic rifles are proven instruments of self-defense and by far the most popular recreational firearms in the United States. The use of commercial litigation and regulatory law to achieve progressive political goals is by now familiar: If an oil company opposes global-warming initiatives, that isn’t politics but “securities fraud,” as far as Democrats are concerned; if conservative activists want to show a film critical of Hillary Rodham Clinton in the lead-up to a presidential election, that isn’t politics but a “campaign-finance violation,” as far as Democrats are concerned. Our legal system has become politicized. Hopefully there is no way this decision will stand. In early November, a Maryland man was killed as police tried to confiscate his guns under a ‘red flag’ order (story here). Obviously the man’s response to the police was unwise, but when you boil the whole story down, the man was killed because he resisted when police came to take his guns. That is chilling. Today The Daily Caller posted an article about recent statement by Democratic California Representative Eric Swalwell. Democratic California Rep. Eric Swalwell suggested on Friday that the U.S. government could use nuclear weapons on its own citizens if they fight back against firearm confiscation. …Swalwell replied to Biggs that any such war between the government and gun owners would be “short” because the government has “nukes,” implying that the government would use nuclear weapons against its own citizens. This is what a threat to the Second Amendment looks like. You may remember the August 5th news story about the eleven children and five grown-ups living in squalor in a New Mexican compound where the children were allegedly being trained to commit terrorist acts. On August 29th, District Judge Emilio Chavez dismissed charges against three of the adults arrested at the compound. Townhall reported, “Charges dismissed against all five defendants due to 10-day rule regarding presenting evidence during preliminary hearings. Judge torched the district attorneys office for their incompetence, wonders if the office is overworked.” Well, it’s not over yet. Yesterday Fox News reported that all five New Mexico compound suspects were indicted by a federal grand jury on Tuesday on firearms and conspiracy charges. The indictment charged the suspects –- Jany Leveille, 35, Siraj Ibn Wahhaj, 40, Hujrah Wahhaj, 37, Subhanah Wahhaj, 35, and Lucas Morton, 40 – “with conspiring knowingly to provide an alien illegally and unlawfully in the United States, possession of firearms and ammunition,” a news release from the District of New Mexico’s U.S. Attorney’s Office said. Leveille, a Haitian national who was in the U.S. illegally, was also accused of possession of firearms and ammunition, the news release said. The defendants are accused of conspiring to get Leveille firearms and ammunition from at least November 2017 through August, the news release said, in addition to moving firearms and ammunition in December 2017 from across Georgia to New Mexico. “The indictment further alleges that, between December 2017 and August 2018, the defendants established a training camp and firing range in Taos County, where they stored firearms and ammunition and engaged in firearms and tactical training as part of their common plan to prepare for violent attacks on government, military, educational, and financial institutions,” the news release said. That is good news. The article reports that all five suspects are due back in court in New Mexico on Wednesday afternoon. Let’s hope they show up. On Wednesday, Judicial Watch posted an article about one of the guns used in the Paris terrorist attack. According to law enforcement sources, the gun was illegally purchased in Phoenix, Arizona. The obvious question is how did it get from Phoenix to Paris. A Report of Investigation (ROI) filed by a case agent in the Bureau of Alcohol, Tobacco Firearms and Explosives (ATF) tracked the gun used in the Paris attacks to a Phoenix gun owner who sold it illegally, “off book,” Judicial Watch’s law enforcement sources confirm. Federal agents tracing the firearm also found the Phoenix gun owner to be in possession of an unregistered fully automatic weapon, according to law enforcement officials with firsthand knowledge of the investigation. The investigative follow up of the Paris weapon consisted of tracking a paper trail using a 4473 form, which documents a gun’s ownership history by, among other things, using serial numbers. The Phoenix gun owner that the weapon was traced back to was found to have at least two federal firearms violations—for selling one weapon illegally and possessing an unregistered automatic—but no enforcement or prosecutorial action was taken against the individual. Instead, ATF leaders went out of their way to keep the information under the radar and ensure that the gun owner’s identity was “kept quiet,” according to law enforcement sources involved with the case. “Agents were told, in the process of taking the fully auto, not to anger the seller to prevent him from going public,” a veteran law enforcement official told Judicial Watch. It’s not clear if the agency, which is responsible for cracking down on the illegal use and trafficking of firearms, did this because the individual was involved in the Fast and Furious gun-running scheme. An ATF spokesman, Corey Ray, at the agency’s Washington D.C. headquarters told Judicial Watch that “no firearms used in the Paris attacks have been traced” by the agency. When asked about the ROI report linking the weapon used in Paris to Phoenix, Ray said “I’m not familiar with the report you’re referencing.” Judicial Watch also tried contacting the Phoenix ATF office, but multiple calls were not returned. The gun was probably sold as part of ‘Fast and Furious,’ which is troubling enough, but I want to know how you get a gun from Phoenix to Paris in this age of airline security. Was it packed in the person’s checked luggage or did he manage to get it through the metal detectors? Did it go from the United States to France or from Mexico to France? How did the gun get into France, which has very strict gun laws? It would be very interesting to trace the journey of the gun from Phoenix to Paris. It is also interesting to note that this story is based on law enforcement leaks. The people who are charged with enforcing our laws have reached the point where they are so frustrated with the unequal enforcement of the laws that they are speaking out. From the beginning of the Obama Administration, one of the goals of the administration has been to remove guns from the hands of ordinary citizens. I don’t believe this goal has ever been stated in those exact words, but if you look at some of the laws attempted and the executive actions taken, that is the goal. One of the early attempts at convincing Americans that guns were really awful was the “Fast and Furious” program. We still don’t have all of the details of the program–there are ongoing legal battles to obtain information about the program, but basically we sold guns to criminals in the hopes that the crimes committed by the people who bought them would sour Americans on the idea of buying or selling guns. The program was discovered and shut down, but the consequences remain. A .50-caliber rifle found at Joaquin “El Chapo” Guzman’s hideout in Mexico was funneled through the gun-smuggling investigation known as Fast and Furious, sources confirmed Tuesday to Fox News. A .50-caliber is a massive rifle that can stop a car or, as it was intended, take down a helicopter. If you are unfamiliar with Fast and Furious, please use the search engine on this site to learn about the program. It was one of the nastiest plans of the Obama Administration. The operation allowed criminals to buy guns in Phoenix-area shops with the intention of tracking them once they made their way into Mexico. The operation became a major distraction for the Obama administration as Republicans in Congress conducted a series of inquiries into how the Justice Department allowed such an operation to happen. Former Attorney General Eric Holder was held in contempt after he refused to divulge documents for a congressional investigation into the matter. This is the third time a weapon from the Fast and Furious program has been found at a high-profile Mexican crime scene. The quote comes from a Washington Post article posted today. Ms. Corban was raped while a student at the University of Northern Colorado. Someone broke into her apartment and sexually assaulted her. After the attack, she realized how important it is for women to have access to guns to protect themselves. Just for the record, you cannot go on the Internet and just buy any weapon–even on the Internet, weapons are sold by dealers who have to do a background check before the weapon is delivered to your home. With all this talk about limiting the sale of guns, has anyone come up with an idea to keep criminals from obtaining guns? Please call me when you have a solution to that problem. Yesterday Katie Pavlich posted an article at Townhall.com about the shooting in Texas at a Mohammed cartoon contest. Nadir Soofi and Elton Simpson were the two gunmen who carried out the attack, after driving from Phoenix, Arizona, to Garland, Texas. It turns out Soofi purchased his gun under the Holder Justice Department’s Operation Fast and Furious back in 2010. As a reminder, Operation Fast and Furious was a program that ran from 2009-2010 in which federal agents purposely allowed the sale of thousands of weapons, including handguns, AK-47s and .50-caliber rifles, to known drug cartels. Agents deliberately allowed weapons to be trafficked and lost in Mexico. As the owner of a small pizzeria, the Dallas-born Soofi, son of a Pakistani American engineer and American nurse, would not have been the primary focus of federal authorities, who back then were looking for smugglers and drug lords. The Fast and Furious Program has fallen out of the national spotlight. However, the consequences of the poor judgement exercised in the conception of that program is still with us. It is ironic that a poorly conceived program to capture drug lords would be used by terrorists to push forward their agenda. Concealed Nation posted a story on May 16th about a mall shooting that had an ending very different from what would have been expected. On May 10th 2014, a 34-year-old man named Fadi Qandil went to the Central mall parking lot in Ft. Smith, Arkansas to confront his estranged wife Tabitha while she was on her way to see a movie with two other people; 23 year old Grayson Herrera, and 27 year old Dustin O’Connor. According to witnesses, Qandil approached the party and told them that he had a gun. He then raised his shirt to display a firearm tucked into his waistband. When he went to reach for his firearm, both Herrera and O’Connor, who are licensed to carry a concealed firearm in their state, drew their firearms and fired at Qandil. Herrera suffered a non-life threatening wound, while Qandil was hit with multiple shots and pronounced dead at the scene by first responders. It is unfortunate that anyone was killed in the shooting, but certainly the intended victims had every right to protect themselves. Had they not been carrying weapons themselves, there would have been three deaths–not one–and the three deaths would have been of people who meant no harm to anyone. Following their deaths, newspaper articles about the ‘alleged shooter’ would have followed, and then a trial and (hopefully) incarceration at the taxpayers’ expense. Justice was served in this incident–quickly and without a lot of fanfare. That is why individual citizens should be allowed to own and carry guns. The long and short of it it–if you missed the deadline, we will take your weapon away. 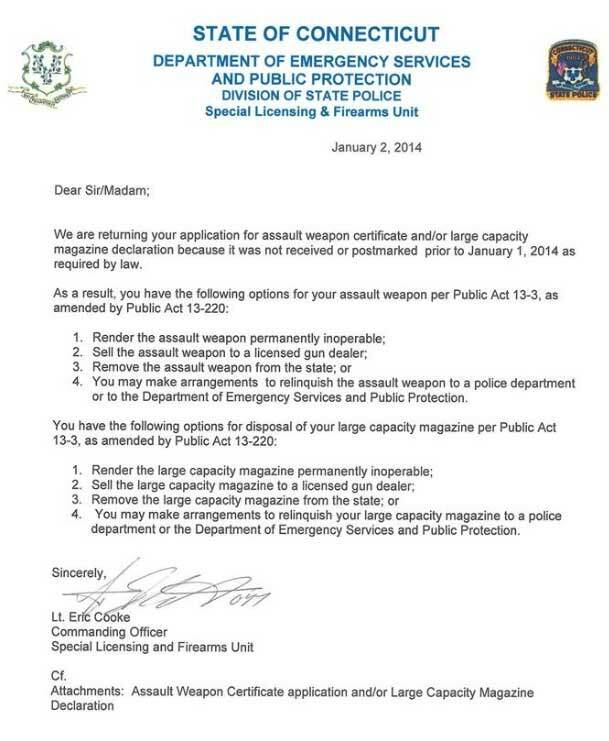 According to the Journal Inquirer, 106 rifle owners and 108 ‘large capacity magazine’ owners in Connecticut were recently sent letters from the state police advising them that they had missed the deadline for registering their now-illicit firearms and accessories. The state knew these individuals had these items because their registration applications were sent in, but postmarked too late to be processed. This should be a wake-up call for anyone who doesn’t see gun registration as the beginning step of gun confiscation. Yesterday The Blaze reported that Connecticut gun owners have begun registering their guns in order to comply with new gun laws that will go into effect on January 1. However, not one gun owner who was registering firearms or magazines said they think the new laws will reduce gun violence. “If people are going to do things illegally, they’re not going to be here registering their gun,” Jared Krajewski, another resident registering firearms, said. For now, in Connecticut, the law is the law. The new gun control measures were put into place following the tragic school shooting in Newtown, Conn.
Common sense tells us that those who have nefarious future plans involving their guns will not be in line registering those guns. All this law does is put a new restriction on law-abiding gun owners–it will have no impact at all on those people who choose to ignore the law. Newtown was a horrible tragedy, but this law may be setting the stage for an even more horrible tragedy–potentially letting criminals know which households have the means to defend themselves if they are robbed. The level of chutzpah in the Obama administration never ceases to amaze me. The latest example is Eric Holder’s recent testimony before the House of Representatives. Hot Air posted a story on the testimony yesterday, complete with a Townhall.com video of the actual testimony.